France's Sebastien Loeb has won a record fifth consecutive World Rally Championship crown after finishing third in the Japan Rally. It was not plain sailing as the Citroen driver spun near the end in heavy rain, but his podium finish was enough to win the title with one race to spare. He said: "That was a terrible rally, it couldn't have been more tricky, but now it's a great moment. It's perfect." Finland's Mikko Hirvonen led Jari-Matti Latvala in a Ford one-two. Hirvonen won two of the final four special stages to finish 31.1 seconds ahead of compatriot Latvala, but there was little they could do to stop Loeb's march to the title. He underlined his dominance of the season with a 12th podium finish in 14 races - 10 of which he has won. 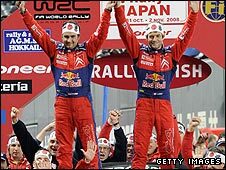 And although Loeb finished two-and-a-half minutes behind Hirvonen after spinning on the penultimate stage, he surpassed Tommi Makinen's record of winning four straight championships from 1996-1999. "I'm so relieved," Loeb continued. "Last year (co-driver) Daniel (Elena) and I equalled the record with four wins, so being the only ones to do five, we are very happy. "I can't say whether this year's title is any finer than the others. "I will always have special memories of our first crown and I don't want to give the impression that winning is something you get accustomed to, it's just that each title feels different." The efforts of Hirvonen and Latvala mean Ford picked up a maximum haul of 18 points to ensure that the battle for the manufacturers' championship will go down to the last rally of the season in Wales. Citroen lead Ford by 11 points, but Hirvonen is already looking to 2009. He said: "Loeb won 10 events before coming here so he deserves it. I did all I could. Now we need to try again next year."